Bad meetings can happen to nonprofits with good intentions. Nonprofits can turn to our template to drive meetings (and their mission) forward. Share the agenda. Meetings fail when it’s not clear what needs to be discussed and why. Our template gives you an organized structure that’s easy to share and add agenda items to. Track action items that arise. Nothing’s worse than discussing what needs to happen next, only to leave the meeting and forget those to-dos. Asana keeps teams accountable and shows who needs to do what by when. Store important information. Use your template to store important reference information, such as reference docs, past meeting minutes, bylaws, and committee reports all in one place. No more lost email attachments! Help nonprofits make a bigger impact by taking one small step. Take advantage of Asana’s work management software and our people to better coordinate across your teams, donors, and volunteers. Board meetings shouldn’t be boring. Follow our blog tips for flipping the meeting script. You’re in service of your nonprofit’s mission, Asana is in service of you. Learn more about how Asana can help your organization. Open Door Rehabilitation Center shares their approach to using Asana across a nonprofit. Learn the best ways to plan meetings with Asana by going in-depth with our on-demand course. Get started with a quick video tutorial on planning meetings in Asana. 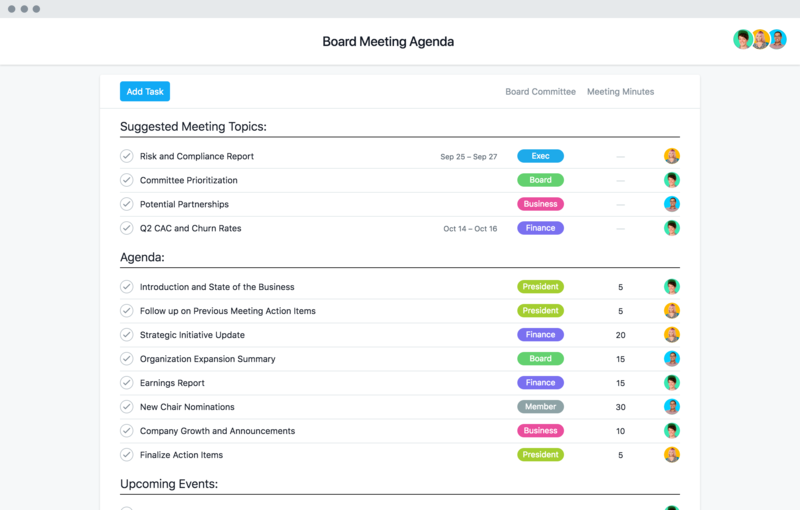 Templates are the first step towards planning better meetings, and with Premium, you can plan your best meetings yet.